Too many travelers whiz up I-93 en route to New Hampshire's popular Lakes Region and White Mountains without ever contemplating a stop in capital city Concord. In recent years, though, the hub of government in the "Live Free or Die" state has become more than a ho-hum urban business center. Expanded cultural offerings, independently owned shops and one-of-a-kind attractions make Concord a destination in its own right. Choose Concord for a getaway, and you'll save driving time and pack more fun into even a short stay. Here are 15 of the top things to do while you're visiting this friendly, livable small city. This interactive space museum and planetarium honors two pioneering New Hampshire astronauts: Alan Shepard, the first American in space, and Christa McAuliffe, who tragically perished aboard the space shuttle "Challenger" after training to be America's first teacher in space. Designed to appeal both to children and grown-ups, it's the place to see unique NASA artifacts like a space toilet and space treadmill (with a harness, of course), to see yourself in infrared light, to experience life in orbit and to understand the history of space exploration and contemplate what lies ahead. For a small add-on fee, don't miss your chance to see a show in the 40-foot planetarium dome. The rivers that once powered industry give Concord its distinctive character, and you can have an outdoorsy experience within city limits by renting a kayak, canoe or stand up paddleboard (SUP) at Contoocook River Canoe Company. Situated on a tributary of the mighty Merrimack River, which flows through downtown, this family-owned outfitter can set you up for a variety of adventures such as a beginner-friendly, 5-mile SUP or kayak excursion on the Merrimack starting in Boscawen Village or a leisurely SUP experience on the Contoocook. Guided kayak fishing tours and SUP yoga classes are also offered. Although the Shaker religion is nearly extinct, the distinctive lifeways and handcrafts of its followers still captivate more than two centuries after a community of Shakers took up residence in Canterbury, New Hampshire, just 12 miles northeast of Concord. While you're in the capital region, be sure to tour this collection of 25 original Shaker buildings situated on 694 acres of gardens, ponds, fields and forests. Watching live demonstrations of traditional crafts like broom making, wool spinning, woodworking and rug braiding will be a highlight of your visit. There's a cafe on site and a lovely nature trail, so you can easily spend the better part of a day in this world away. Canterbury Shaker Village is open seasonally from early May through early December. Downtown Concord is graced with a number of large-scale permanent public art works, which are complemented each year by a new "Art on Main" collection of temporary installations. Concord is also home to a number of craft and fine art galleries including the must-visit League of New Hampshire Craftsmen Concord Fine Craft Gallery. You'll also discover a pair of galleries at the Kimball Jenkins Estate, and this multifaceted destination's School of Art offers a busy schedule of one-day and multi-session classes for all ages and abilities. The New Hampshire Historical Society Museum, located in the organization's glorious, Greek-temple-like 1911 headquarters building, is home to the largest collection of artifacts that tell the state's story. From Native American creations to 19th-century paintings of the White Mountains to memorabilia from New Hampshire's "first in the nation" political primaries and so much more, this is your place to understand the Granite State's accomplishments and distinctive attitude. Open year-round, the museum and its library captivate casual browsers while offering a depth of resources for researchers and genealogists. This three-screen arthouse movie theatre has its own dramatic story. Built with passion and from nearly $2 million contributed by community supporters, it first opened in 2007 and has earned accolades for its programming and the intimate film-viewing experience it creates. Come hungry and thirsty because in addition to popcorn and soft drinks, the non-profit theater's Indie Cafe serves sandwiches, Mitchell’s salsa and chips, New Hampshire wines and beers and locally made chocolates. Screenings of foreign, independent, local, nature, classic and family films are complemented by special events. This city-owned, 85-acre park is lushly wooded and veined with trails that are short but steep enough to demand some exertion. Add in old-growth specimen trees, a peek-a-boo vista of the State House's gold dome, mountain views and — in the fall — striking foliage colors, and this becomes not only a place to stretch your legs and lungs without leaving the city but a must-visit spot for photographers. The property is dog-friendly. Parking is available at the trailhead on Fisk Road. New Hampshire's capital offers plenty to excite beer fans. With two innovative breweries of its own and nearly a half-dozen more nearby, you can plan an entire weekend around sampling freshly crafted pints. Concord Craft Brewing Co. was the first nanobrewery to open its doors in the city, and you'll always find eight of their current creations on tap: Many, like Ballot Box Brut IPA, have names with political overtones. Lithermans Limited is actually defying limits: How else can you explain a sour ale inspired by fruitcake? Hang out with the brewers, listen to tunes and sample the latest experimental and seasonal brews. Still thirsty? Blasty Bough Brewing Company, a farm brewery in nearby Epsom, New Hampshire, is worth finding especially on concert nights. NH Audubon’s oldest environmental center is located in Concord, and it's your place to see birds of prey like a bald eagle, a screech owl and a peregrine falcon, as well as to head out with binoculars on Silk Farm Sanctuary trails to look for native and migrating species. The Susan N. McLane Audubon Center hosts a variety of educational programs that are open to the public, too, such as animal tracking walks and adventure treasure hunts. The longevity of Gibson's Bookstore is remarkable. Founded in 1898 and still fiercely independent, it's the oldest continuously operating retailer in Concord and a haven for bibliophiles. Not only will you find something here you want to read, you can treat yourself to coffee, tea, treats or lunch at the store's True Brew Café. What really distinguishes this literary destination is its line-up of author talks and book signings: More than 100 events are typically scheduled each year. Concord's premier performance venue is one of New Hampshire's best places to see a concert or theatrical production. This classic 1927 theater has been modernized without compromising its charms, and its come-as-you-are vibe makes its eclectic line-up of performances approachable for all visitors. When Broadway touring shows are in town, they're a ticket you don't want to miss. Live Broadcasts from The Met bring New York City opera to this northern capital. 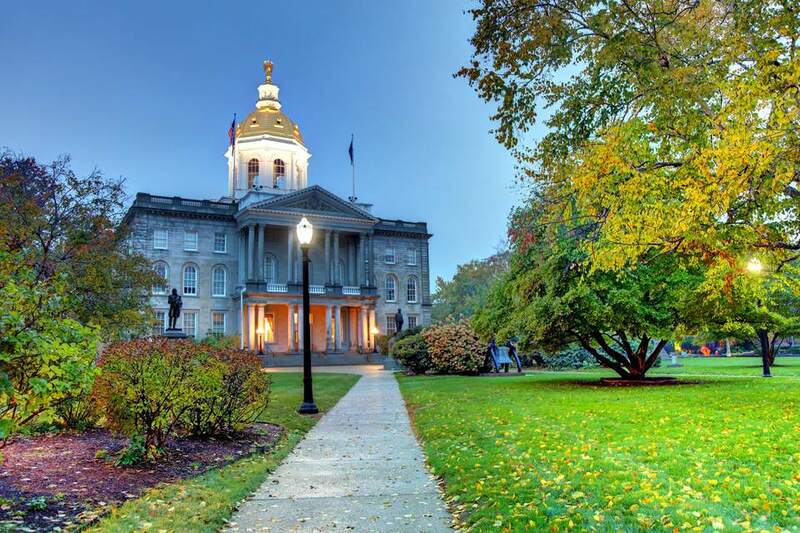 Built of granite (of course) in Greek Revival style, the gold-domed New Hampshire State House has been in use since 1819. It has the distinction of being the oldest state capitol building in which both legislative houses still meet in their original chambers. You'll learn this and more on a free tour of this building where the live action of governing New Hampshire takes place. Self-guided tours are always available from 8:15 a.m. to 3:15 p.m. weekdays, and guided tours are also frequently available. Stop into the Visitor's Center when you arrive to check your tour options and to explore the shop filled with unique New Hampshire gifts. Only one U.S. president has hailed from New Hampshire, and if you're in Concord from mid-June through early October, you can visit his home. Here in his native state, Franklin Pierce is looked upon far more kindly than he is in history texts, where he is frequently dubbed one of the worst presidents of all time. On your tour, he'll become more three-dimensional and more fascinating, and you'll also hear the interesting tale of this building, which was saved from destruction by local supporters and moved to its present location in 1971. Once you've been introduced to Pierce as a tragic and complex figure, you may want to plan a side trip to the president's childhood home, the Franklin Pierce Homestead, which is a half-hour drive west in Hillsborough, New Hampshire, or pay respects to the president at Concord's Old North Cemetery: his final resting place. Yes, New Hampshire's capital has its own apple orchard, and a fall outing to pick fresh fruit from the trees is a tradition embraced by locals and visitors alike. Carter Hill Orchard is also known for its apple cider pressed on-site, and if you visit the orchard, you can taste it unpasteurized and full of apple-y flavor. Other pick-your-own crops that ripen in summer and early fall include blueberries, peaches and raspberries. You'll love the mountain views from these lands, which have been farmed since 1740 and are forever preserved as agricultural space. Shopping in the Country Store is a must, too. With 150 dealer spaces under one roof, the Concord Antique Gallery is a treasure hunter's dream come true. You'll find eclectic collectibles, antique furnishings, old books, art, vintage jewelry, vinyl records and gazillions of decor items to recycle and upcycle on two floors in this 10,000-square-foot mall, which is open daily year-round. The best time to shop is during the annual Midnight Merriment event in early December, when hours are extended until midnight and everything in the gallery is discounted.